DisplayMart.com is a store supply and fixture website specializing in providing retail stores and other small businesses with the highest quality of store displays for the lowest prices. 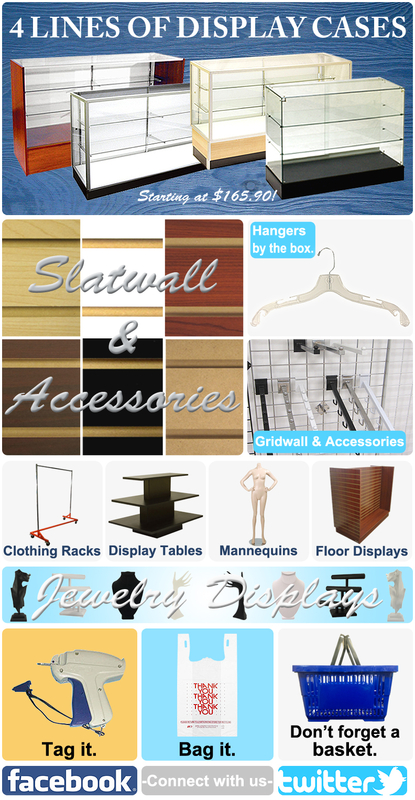 Garment racks, showcases, tower display cases, check-out counters, slatwall with slat panel accessories, gridwall with grid panel accessories, jewelry displays, mannequins, mannequin forms, and much more can all be found at DisplayMart.com. If you are an independent retailer or own a small business and want to find new store fixtures at wholesale prices, then DisplayMart.com is for you! We offer competitive pricing on a vast selection of garment racks at DisplayMart.com. While round clothing racks and double bar clothing racks allow for a large quantity of garments in a small space, we also offer spiral clothing racks, 2-way clothing racks, and 4-way clothing racks which gives you that boutique look you are searching for. For those on the go, DisplayMart.com also offers collapsible salesman clothing racks which can be assembled and disassembled in a matter of seconds. Every garment rack on DisplayMart.com is of the highest quality while at the lowest price possible!